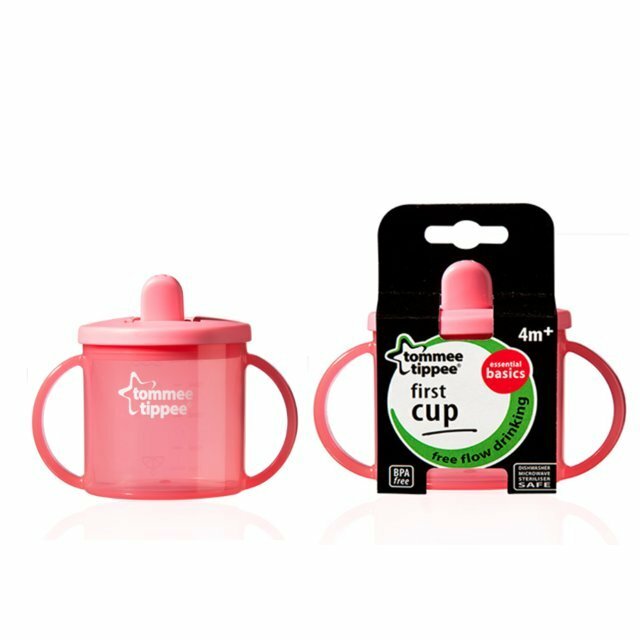 Tommee Tippee Essentials Basics First Cups is designed with easy to hold handles for baby and a leak proof flip spout for mum which is ideal for travel. It also has graduations and juice lines on the side to ensure correct dilution of juices. It is dishwasher and steriliser safe and also BPA free. BPA free Flip up and free flow! Please read and retain this important information also located on the reverse of this pack for future reference. Before first use, clean the product. Clean before each use. Always wash the product immediately after use. Wash in warm soapy water and rinse in clean water or use a dishwasher (top shelf only). Do not clean with solvents or harsh chemicals. Do not allow product to come into contact with oil based foods (e.g. oil/tomato based sauces) as staining will occur. Suitable for sterilisation by steam (electric and microwave), boiling or cold water tablet / liquid solution.